The Shelburn Line operated from the Brittany coast in conjunction with the Royal Navy’s 15th Motor Gun Boat Flotilla (established in 1942), operating mainly from Dartmouth and at times Falmouth. Motor Gun Boats (MGBs), and Motor Torpedo Boats (MTBs), together with other light craft and fishing boats had been operating throughout the war from June 1940, most sailing from the Helford River and the Scilly Isles until 1942, when the 15th Motor Gunboat Flotilla became based on the River Dart. The routes operated until November 1944. The Flotilla operated in the ‘no-moon’ period; grass ropes were used for anchor chains to enable them to be cut with an axe in an emergency and to be much quieter, and the oars of the surf-boats were muffled. The North and West coasts of Brittany were mainly used by SOE and SIS to insert and extract agents, but also collected evaders and other fugitives. The Shelburn line was created mainly for use by MI9 and was in place from December 1943 until its last pick up, which took place on the night of 23/24 July 1944. The Line was based on a previous line (Oaktree), which became compromised in 1943, many of its evaders then being passed to the Burgundy Line. The fact that the Shelburn Line was formed at all is due to the insistence of Raymond Labrosse, who had been the French Canadian radio operator for Oaktree. When Oaktree was ‘blown’, Labrosse joined a group of evaders, and took them south over the Pyrenees and on to Gibraltar. On return to England he informed MI9 that sea evacuations from Brittany should not be abandoned, but performed differently. On the 11 October 1942, a number of evaders gathered in a deserted villa at Canet Plage near Perpignan. They were waiting for an RV [rendez-vous] with a fishing boat from Gibraltar. The pick- up had been arranged by the Pat O’Leary Line and amongst the evaders was a Sergeant Major from the Canadian Regiment, The Fusiliers Mont-Royal. The man was Lucien Dumais, a Commando captured at Dieppe. He had escaped and made his way to Marseille. 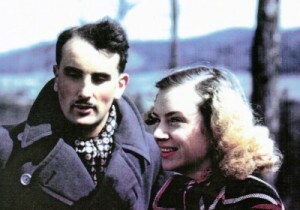 Dumais was taken off the beach by the falluca Seawolf on Operation Rosalind and returned to England where he volunteered to work with MI9, but was turned down. Later after service in North Africa, he again applied for duty with Special Duties, and this time he was accepted. On the night of 16/17 November 1943, a double Lysander pick-up took place, piloted by S/Ldr Hugh Verity and F/O Mac McCairns of 161[SD] Squadron, to deliver Dumais and Labrosse to a field WNW of Soissons, 2km SW of Selens. Their role was to set up the Shelburn Escape Line. The Lysanders then returned to England carrying Edgard Potier of the Possum Escape Line and five aircrew evaders. 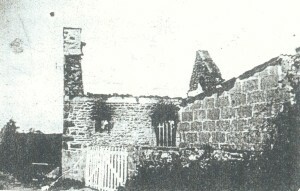 By December 1943, Dumais and Labrosse had safe-houses in place in Brittany, and a main holding area and safe-houses in Paris. Couriers had been recruited locally, a beach was selected at Anse Cochat, and MI9 was informed that the line was ready for its first operation. The beach had been code named ‘Bonaparte’. 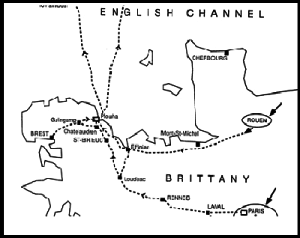 The skill of navigators on the Brittany run was paramount. The coast was difficult and dangerous. Currents were very strong, there were hidden rock outcrops everywhere and at times the weather was appalling. Mist and snow-storms were frequent in winter and the rapid rise and fall of the tidal system increased the problems. The operational plan was for all evaders to be gathered at the line’s holding centres (safe-houses) in Paris until a pickup was imminent. They would then be moved to other safe-houses in the coastal region around Plouha and Guingamp. The pickup was always confirmed over ‘Ici Londres’ the BBC ‘messages personal’ service to ‘our friends in France’, using the message ‘Bonjour tout le monde a la Maison d’Alphonse’. After the line’s first operation it became clear to MI9 in London that the Shelburn Line was well organised, well prepared and planned and had good security. At Dumais’ request, MI9 forwarded a mine detector to clear the beaches. Most escape line couriers only travelled with one or two evaders. However, on Shelburn, at times, up to twenty evaders were placed in the back of a truck with shovels and picks; They were required to remember a sentence in Polish and told that their cover story was that they were workmen working on coastal defences for the Germans. As a courier once said ‘They will shoot me with one evader, and they will shoot me with twenty evaders. What is the difference?’ The general routine was for evaders to be given sandwiches and fruit for their journey and then to be taken from their safe-houses to the coastal cliffs where they would lie low while their courier checked the route and the beach for mines. If mines were located the courier would place a white handkerchief carefully on top of them. On the approach of the surf boat(s) the courier signalled the evaders to descend along the cliff path, avoiding the ‘white handkerchiefs’ on the way. Once the evaders were safely boarded the courier returned back up the cliffs, collecting in the handkerchiefs. •The first operation took place from Bonaparte beach on the night of 28/29 January 44, with 19 evaders (MGB 503 (Op Bonaparte). •The second operation took place on the 26/27 February with 18 evaders (MGB 503)(Op Bonaparte II). •Other operations took place on 16/17 March with 25 evaders (MGB 502)(Op Bonaparte III), and 19/20 March with 26 evaders(MGB 503)(Op Bonaparte IV). •and 23/24 July with 6 evaders (MGB 502)(Operation Crozier II). •On 9 August a further operation took place in daylight to recover three agents (MGB 718)(Operation Crozier III).